Tim Daley of Newport last year took over as host and coordinator of the annual Newport Christmas Dinner. The event has been held at the American Legion Post 21 in Newport for more than 20 years. This year, for the 28th annual dinner, Daley decided that he would not have the party at the Legion without a lift to assist individuals in getting up the stairs. Daley also said that he would help in the fundraising effort to make the lift a reality. Daley mentioned his plans to Fran and Melanie Azur of Newport Town. The Azurs wanted to know if the Christmas dinner and the lift benefit the community, which they do, said Daley. The Azurs donated the $3,500 to cover the cost of the lift and have also contributed in helping the Christmas Dinner event move forward. This coming year, Daley has some special surprises in the works to make the event even more spectacular and festive for celebrants. The planning includes collaboration with several area artists. Daley is co-hosting the event with the Wooden Horse Arts Guild. "The goal of a new playground has become a reality." "A generous donation of $30,000 from Fran and Melanie Azur, along with fundraisers that yielded $9,000 brought the project to life." Indoor Recreation of Orleans County (IROC) recently received several generous donations allowing more area children to have a free membership. On Town Meeting Day Coventry residents voted to pay $4,095 for Coventry children to have a one-year IROC membership. The next day Vermont Highland Cattle Company owners Fran Azur and Melanie Gefert donated $13,785 to pay for memberships for the children of Newport Center, Troy, Lowell, and Brighton. "Melanie and I are happy to participate in IROC's Youth Initiative. We picked these four towns because we have farms in Newport Center, Troy, and Lowell and we have just invested in the plant in Island Pond," Azur wrote in a press release. Thank you for your $14,185 donation in support of IROC's Youth Initiative to help cover the cost of youth memberships for kids living in the towns of Lowell, Troy, Newport Center and Brighton. The response to this initiative has been terrific. We now have 3,000 youth members at IROC from throughout Orleans and northern Essex Counties. Donations such as yours have enabled us to expand our after school, weekend, and vacation programs for kids. And we have been able to add a Youth Coordinator position to help plan a wide variety of activities and athletic events specially designed for kids." Fran Azur, a native of nearby Newport, Vermont, first saw harness racing at the Barton Fair in the 1950s and though he now lives near Pittsburgh, he never forgot where he came from. He now owns top open class pacers Noble Falcon and Blueridge Western and he and trainer Kevin McDermott arranged to ship the two geldings to Barton for an exhibition race, along with their respective regular drivers Brian Sears and Tim Tetrick (top drivers in North America). "Just to do something for the fair," was Azur's motive, and he provided $16,000 in purse supplements for the two day meet, where horsemen, largely hobbyists, orginarily compete for purses less than $1,000. He also underwrote promotional costs for the event. Azur has a home near Barton and also owns several businesses in the area, including a Scottish Highland Cattle farm. Azur flew Tetrick and Sears to Barton in his jet for the day, and the two drivers spent hours greeting horsemen, fans and signing photos. Kim Brooks, who coordinated the event at Barton echoed McDermott's sentiments. "We can't thank Fran Azur enough and we're already talking about what to do next year. He wants to find a way to help support the horsemen who race here regularly." "Programs like these epitomize the Vermont character of neighbors helping neighbors," stated Fran and Melanie Azur, owners of Vermont Highland Cattle Company. "It is an important part of our corporate and personal mission to be good neighbors in our Vermont communities", said the Azurs. "We are pleased to be a part of that Vermont tradition." "I would like to thank the Vermont Highland Cattle Company and Fran & Melanie Azur for their very generous support of the Leukemia & Lymphoma Society (LLS). Your commitment to giving to the community has moved the LLS one step closer to finding a cure for blood cancers! Your contribution will go toward funding research for innovative treatments, as well supporting patients and families living with these cancers today. Thank you so much for your generosity." "During a time when the needs in our community are so great, NEKCA would like to recognize the generosity of the Vermont Highland Cattle Company for its significant contributions to the community food shelf and to the 2008 Toys for Kids of Vermont Toy Drive." "A canceled fundraising dance due to weather conditions left the British literature classes of North Country Union high School trip to Europe in jeopardy of being canceled," stated NCUHS teacher Cheryl Currier. "The Azurs graciously offered to make up the missing funds." "Fran and Melanie Azur, owners of Vermont Highland Cattle Company, wanted to make a noticeable improvement to Newport City's downtown." "So they decided to pay for four new clocks in the Orleans County Courthouse tower" noted Patricia "Trish" Sears, CEO of Newport City Renaissance Corporation. A generous outpouring of donations enable the Fix Our Field committee to exceed its fund-raising target. That was the announcement committee coordinator and the Lake Region Union High School Board's Albany representative Marybeth Whitten told her colleagues on Thursday night. Fran and Melanie Azur of Newport Center, on behalf of their business, the Vermont Highland Cattle Company, pledged the full $12,000 to help the group reach its goal. The company recently acquired the old Comstock building in the Orleans Industrial Park, and was eager to make a gesture to support a noble community cause, Mr. Azur said in his email to Ms. Whitten. Fran and Melanie Azur of Newport Center donated more than $3,000 for gifts purchased at Wider Than The Sky and The Woodknot Bookshop. The local stores reduced prices so more could be purchased, said organizer Patricia Sears, executive director of Newport City Renaissance Corp.
Five area food shelves got a nice boost form an Orleans county businessman. Fran Azur donated $3,000 to each. In addition, each of the food shelves will receive 200 turkeys to distribute for the holidays. "Ray Edwards, Sales Manager for Vermont Highland Cattle Company, said the Company will donate 2,000 pounds of meat to schools in Coventry, Newport Town, Troy, Jay/Westfield and Lowell over the 2008-2009 school year." Reported Christopher Roy of The Newport Daily Express. "The meat donation comes with an educational component for the students." Edwards said. "The beef is coming from farms that the children know and can make a connection to." 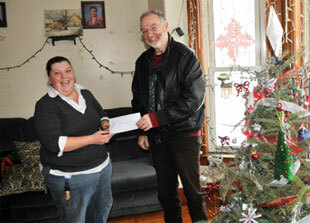 NEWPORT CITY - "This is the best Christmas ever," were the words out of Brenda Ashman's mouth as Steve Mason presented her with a $1,722 check Thursday morning. "I'm going to get to see my mom." Ashman's family was one of 29 local families to receive the money donated by Fran Azur. Azur is known for the Highland Cattle Company as well as trying to bring jobs to the economically deprived Northeast Kingdom. Mason said the majority of the people to receive money live in Island Pond, but some live in Brownington, Newport and Derby. He said Azur gave money to everyone who asked for it. "I am so excited," said Ashman. "He made our Christmas and our whole year. Thank you so much." "We understand that gifts like this are not the long-term solutions we need," Azur said. "But it is important for families down on their luck to see a ray of joy at some times, especially this time of year. It's good for all of us to know others care." 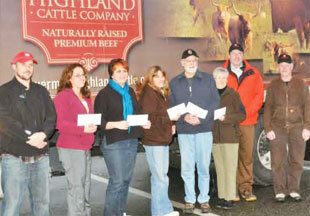 A 2,000 pound donation of beef from Vermont Highland Cattle Company will benefit five Orleans County food shelves. Newport City native Fran Azur and his wife Melanie Gefert Azur have donated $225,000 to IROC as part of the renewed capital campaign. Phil White, Chairman of the IROC Board of Directors stated, "They have done well in their lives but remain committed to their home town community... Their generosity is truly inspiring." Indoor Recreation of Orleans County (IROC) reduced a large portion of its debt load Wednesday when Fran Azur and Melanie Gefert, of Newport Center and Pennsylvania, stepped in to help IROC settle a large debt. Azur negotiated with The Jenesis Group in a deal where Azur paid $65,000 toward the IROC debt of $650,000 and fully eliminated the debt. The unsecured note of $650,000 was to come due Nov.1 and could have forced IROC into bankruptcy. Today IROC owes $650,000 less than it did a week ago. White called the donation from the Azurs "extraordinarily generous." The Azurs are well known in the Kingdom for their philanthropy. "Melanie and I are pleased to be a part of helping IROC in its tremendous progress towards developing a great community resource in The Northeast Kingdom," Fran Azur said. "Although there is a lot more hard work to be done, this gets us one big step closer to refinancing and restructuring our debt," White added. "It was success enough for one day that Jenesis made this concession. But for Fran and Melanie Azur to make this payment on IROC's behalf and clear this obligation from our books is a huge boost." "You guys are STARS. Not sure how I express our gratitude adequately. Your 2008 donation of $41,000 following your $27,000 donation in 2007 and $27,000 in 2006 is truly appreciated." It is my privilege and honor to write on behalf, of the members, of Memphremagog Lodge # 65 F. Your very generous gift of $17,500 to help pay our lodge taxes for the next 5 years was a welcome surprise. I wish you could have been there during the presentation to see the faces of everyone at the dinner. Everyone was overcome with appreciation. The outcome of the recent vote on town meeting day was quite a blow to our lodge. Thank you for your generous gift and sharing your memories of your father in the Masonic Organization. "Newport native Fran Azur and his wife Melanie donated $45,000 to pay off the mortgage on the Samuel Read Hall House which will become a center for education at The Old Stone House Museum," announced Orleans County Historical Society Trustee Kerm Smith. "After reading an article last week about Vermont's North Country Chamber of Commerce and the newly planned Welcome Center ground breaking being delayed, Fran and Melanie Azur, owners of Vermont Highland Cattle Company, decided to act now to recharge local fund-raising to help make the building a reality" stated Tod Pronto, the Chamber's Executive Director. Representatives of the Brighton Fire Department accept a donation of $30,000 from Melanie and Fran Azur. The money will be used for a stove, refrigerator, a washer for heady-duty turnout gear, and equipment for trucks. Copyright 2016 Vermont Highland Cattle Company. All rights reserved.